Heinrich Hagelganz was born April 15, 1880 in the Volga German colony of Kutter, Russia. He was born into a Christian family, who dedicated their son to God in holy baptism in his infancy. Heinrich was only ten years old when his father died. A few years later, he began an apprenticeship to become a cabinet maker in the Russian city of Saratov. Because he left home at such a young age, Heinrich looked to God for love and comfort. In his later years, after receiving instruction in the cardinal truths of the Bible and church doctrine, he was confirmed and admitted to church membership. Young Heinrich acquired a good education in Russia and he made good use of this gift after he came to America. At the age of 19 he consecrated his life to God, whom he served faithfully unto the last day of his fruitful life. On May 5, 1901, at the age of 21, Heinrich married Elisabeth Jacoby (also Jacobi) who was born on December 24, 1879 in the colony of Kutter. Heinrich learned of opportunities in America from his friend Heinrich Gerlach who lived in Portland, Oregon. In the summer of 1906, the family traveled by rail from Saratov to the port of Libau, Russia (now Liepāja, Latvia) where they departed by steamship to England. On August 30, 1906, Heinrich, his wife Elisabeth and their three young children: Maria (born in Kutter), Katharina and Jacob (both born in Saratov) sailed from Liverpool aboard the steamship Ottawa. The family arrived in Quebec, Canada on September 6, 1906 and they continued their travel directly to Portland by train on the Grand Trunk Railway crossing into the United States at Detroit, Michigan. The ship records show that one-half of the passage was paid by Heinrich and the other half was paid by Heinrich Gerlach. Heinrich and Elisabeth Hagelganz with their three children. Photograph courtesy of Joanne Krieger. After the Hagelganz family arrived in Portland, they briefly lived in the household of Heinrich Gerlach at 945 Haight Avenue (now 4415 N. Haight Avenue). A short time later, they rented their own house at 797 Haight Avenue (now possibly 3807 N. Haight Avenue). Heinrich found work as a cabinet maker. 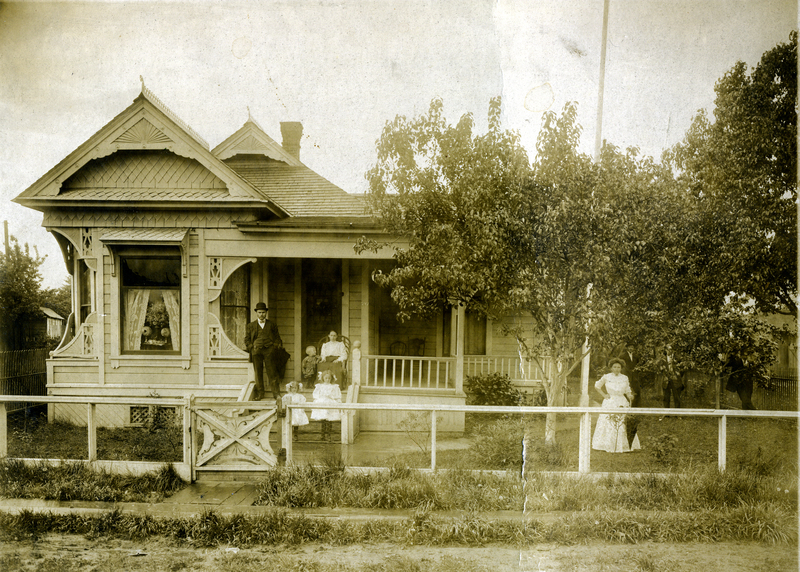 The Hagelganz family at their rental house at 797 Haight Avenue, circa 1907. Photograph courtesy of Joanne Krieger. Soon after his arrival in Portland, Heinrich and his family joined the Free Evangelical Brethren Church where he organized the young people’s Christian Endeavor Society of the church and was active in the church choirs. His gift for preaching was readily discovered and the church elected him assistant Elder. Heinrich's wife, Elisabeth, became ill and she died on June 6, 1910. After her death, Heinrich married Emilie Bartholoma on September 9, 1910. Emilie was born in Volga German colony of Walter, Russia. Three children were born from this union: Ruben, William and Minna. Heinrich became a naturalized U.S. citizen in May 1911 with Rev. John Hopp and John Krieger as his witnesses. 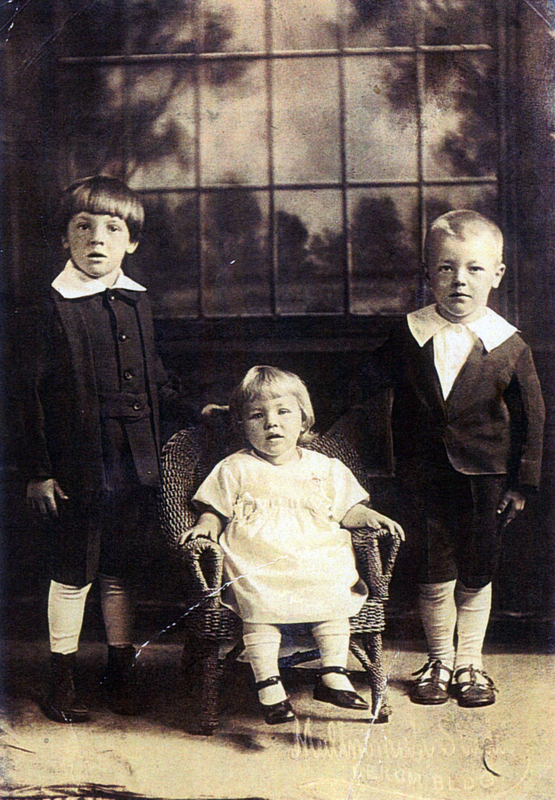 Reuben, William and Minna Hagelganz. Photograph courtesy of Joanne Krieger. Heinrich continued to be active in the church and he felt God's call to become His servant. He answered the high calling by saying: “Here I am – send me!” Heinrich was ordained on July 7, 1911 to become a minister of the Gospel. His first charge was the small German Congregational Church of Cedar Mill in the Bethany community (located at the current intersection of Highway 26 and the Bethany Boulevard overpass) which was organized in 1887. He ministered this congregation for about four years. The family lived near the church but also continued associating with friends from the Free Evangelical Brethren Church in Portland who had encouraged him to become a pastor. The road they traveled from the Bethany community to Portland was made of wood planks. They likely travelled over Cornell Road to the foot of NW Quimby (where the Albina Ferry landing was located) and then up Albina Avenue to the primary Volga German settlement, a journey of about 11 miles. On June 1st 1913, Brothers G. Hohnstein, C. Wacker, L. Deines and Christian Baecker (all members of the Free Evangelical Brethren Church) went to visit Rev. Hagelganz in Bethany and shared their thoughts concerning their dissatisfaction with those controlling the church and its doctrine. Rev. Hagelganz encouraged these Brothers to reconcile their differences if possible. When it became clear that reconciliation was not possible, Rev. Hagelganz agreed to help form a new congregation. A group of at least 29 members from the Free Evangelical Brethren Church met with Rev. Hagelganz at the home of Melchior Krieger on June 22, 1913 where they formally organized the Zweiten Deutschen Kongregationalen Gemeinde (Second German Congregational Church). The name of the new church recognized that Ebenezer was the first Congregational church in Portland. A vacant lot was purchased at corner of NE 8th and Skidmore and a church structure was built in the summer of 1913. After Heinrich's second wife, Emilie passed away on March 9, 1926, he married Marie Spanjer from Ritzville, Washington. 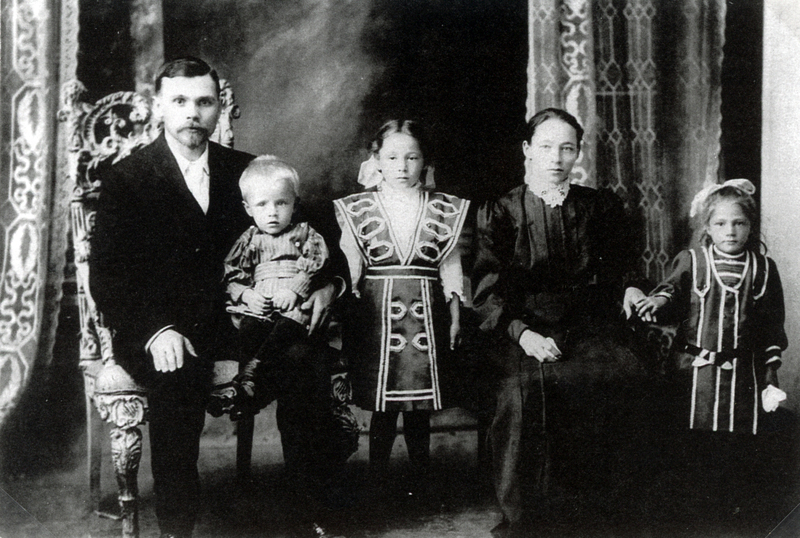 Marie's parents were born in Germany, lived in Illinois and later settled in Eastern Washington. Heinrich met Marie (Mary) while attending the Pacific Conference of German Congregational Churches. One daughter, Alma, was born from this union. In 1927, the Hagelganz family settled into the newly built parsonage next to the Second German Congregational Church at 912 East 8th North (now 4222 NE 8th). Rev. Heinrich Hagelganz and his third wife Marie Spanjer. Photograph courtesy of Joanne Krieger. A Christmas card sent by Rev. Heinrich Hagelganz and his wife Marie and daughter Alma. Courtesy of Joanne Krieger. Except for a two year period (1927- May 1929), when he was called to be pastor of a church in Fort Collins, Colorado, he served his beloved Second German Congregational Church continuously until his death. Rev. Hagelganz was a driving force in the expansions of the church building in both 1921 and 1932 to accommodate its growing membership. Music played an important role in the church which had active choirs and bands. The Radio Club of the Second German Congregational Church was a very popular program in Portland and the surrounding area. The half hour program was broadcast on KWJJ every Sunday evening from 9:30 to 10:00. Vocal music by choir members was followed by an inspirational message by Rev. Hagelganz. Rev. Hagelganz had often indicated that he did not wish ever to be a burden to anyone because of age or physical frailty. God answered his prayer and left him in active service up to his last Sunday sermon on January 23, 1949. Reverend Hagelganz was interred at the Rose City Cemetery in Portland. Reverend D.K. Schmidt officiated the memorial services assisted by the Reverends: Carl Brost, T.C. Strobel, William Koenig, Jonathan Webber, and J.C. Schwabenland. His faithfulness made him a part of his church, and every member had become a part of him. The intimacy between the pastor and the members, especially with those he had baptized, confirmed, united in marriage, lead to the Lord, and taught in the way of God, had become beyond comparison. His friendliness and his sound humor had made him a friend of everyone who knew him. His words of encouragement and comfort were a "balm to the weary" wherever he met an unfortunate brother or sister. He was one of the few persons who could find joy in God's great outdoors as well as in the holy sanctuary of his church. When asked if he had any hobby, he sternly answered: “Yes, to win souls for Christ.” He took great interest in either conducting revival meetings or in participating in them and was well qualified in both singing and speaking. At the time of his death he was moderator of the Pacific Conference of German Congregational Churches and had served on committees of the General Conference of German Congregational Churches. Marie Hagelganz died on January 20, 1968 and was buried beside Heinrich at the Rose City Cemetery. 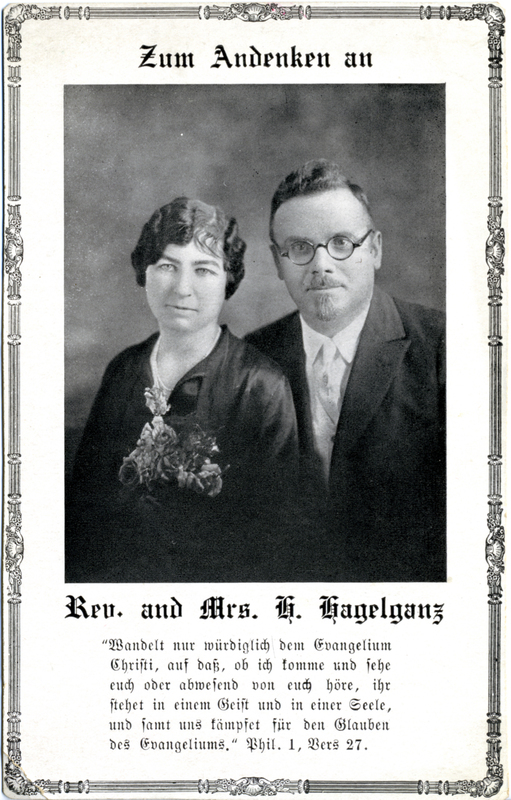 Dr. James Hagelganz, a grandson of Heinrich, followed in his grandfather's footsteps and also became a pastor. Memorial card for Rev. Heinrich Hagelganz, February 1st, 1949. Obituary for Rev. Heinrich Hagelganz from The Christian Messenger.